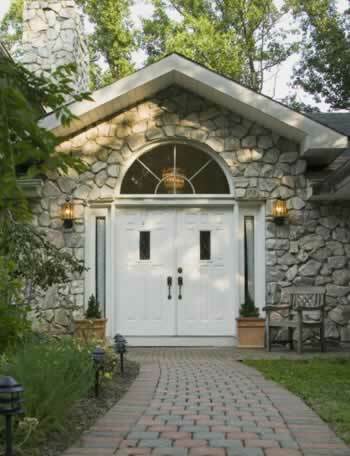 If you thought you had to spend a fortune to install a fine-looking set of exterior double doors, think again! This example of a double, eight-panel set of vinyl doors replicate are well-suited to complete traditional, historical, or period home entries, or they work wonders with contemporary designs. The doors in this photo allow the homeowner to show off the charm of the brick exterior, chimney, and walkway without distraction. The net result is an inviting, secure entry with dual windows that lend great appeal to the visitor. The vinyl windows in the archway offer a tantalizing glimpse of the interior chandelier. The high-quality, easy-to-maintain double doors offer more than a simple cost value. They help insulate the broad opening against energy leaks and exterior noise. And you won't have to paint them year-after-year to cover weather damage more common to wooden replacements.